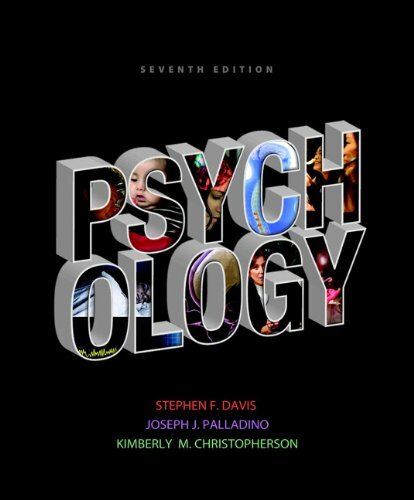 Accessible, Active, and Applied with a focus on different learning styles Designed to make the Introductory Psychology course an engaging, relevant, and interactive experience, the authors of the new seventh edition of Psychology offer multiple decades of combined teaching experience to create an accessible textbook that encourages applied and active learning. Through this book's accessible, active, and applied approach, users determine whether their learning style strengths are verbal/linguistic, logical/mathematical, visual/spatial, or interpersonal. By encouraging them to study according to their own personal learning style, Psychology helps students become more effective and efficient learners. The seventh edition can now be packaged with Pearson’s MyPsychLab providing students with an interactive eText, personalized study plans, and automatically graded assignments giving them an even more engaging experience! A better teaching and learning experience This program will provide a better teaching and learning experience– for you and your students. Here’s how: Personalize Learning – The new MyPsychLab delivers proven results in helping students succeed, provides engaging experiences that personalize learning, and comes from a trusted partner with educational expertise and a deep commitment to helping students and instructors achieve their goals. Improve Critical Thinking – Features such as Myth or Science, Check Your Progress, and Psychological Detective teach students to connect theory and concepts with real life. Engage Students – The authors continue a seamless narrative that keeps students engaged. Explore Research – This new edition features new and updated research in almost every chapter. Support Instructors – This book is supported by Pearson’s unrivaled instructor resources for introductory psychology, including the new 17 episode MyPsychLab video series, an expansive class-tested Test Bank, interactive PowerPoints, an easy to use Instructor’s Manual, Clicker questions and support for a broad range of learning management systems. All of these materials may be packaged with the text upon request. Note: MyPsychLab does not come automatically packaged with this text. To purchase MyPsychLab, please visit www.mypsychlab.com or you can purchase a ValuePack of the text + MyPsychLab (at no additional cost). ValuePack ISBN-10: 020591179X / ValuePack ISBN-13: 9780205911790.